I read this story in the Hill last week. Egypt’s general prosecutor on Tuesday issued arrest warrants for Florida Pastor Terry Jones and seven Coptic Christian Egyptians linked to an anti-Islam video on YouTube that sparked riots across the Middle East, The Associated Press is reporting. The eight individuals, none of whom are believed to be in Egypt, are charged with harming national unity, insulting and publicly attacking Islam and spreading false information. They could face the death penalty. Jones promoted a 14-minute trailer for the movie, “Innocence of Muslims,” on the anniversary of the Sept. 11, 2001, attacks. 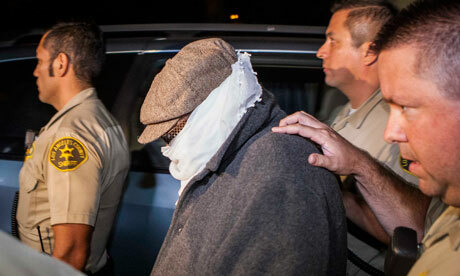 The man behind the film, California-based Nakoula Bassely Nakoula, is also among those charged. I expect that the Justice Department will be arranging for their arrest and extradition as quickly as possible. Though maybe Obama will wait until after the election when he will be more flexible. This entry was posted on September 23, 2012 at 2:39 pm and is filed under Foreign Affairs, Religion, Religion of Peace, Tongue in Cheek, What's Happening. You can follow any responses to this entry through the RSS 2.0 feed. You can leave a response, or trackback from your own site.